Our enduring – and practical – love of white sanitaryware means that bathroom paint colour schemes can be somewhat unadventurous. Plus, if you're creating a stylish bathroom on a budget, you might not want to spend too much on new wall or floor tiles. So, why not transform the look of your bathroom new paint colour ideas? Need more practical tips on how to plan and design a bathroom? We've got you covered over in our advice feature so make sure you check that out too. Which paint colours to consider for bathrooms? Which paint shade to choose for a bathroom? Light colours will of course make the room feel bright and more spacious, but if you get lots of natural daylight in the room, there's no reason not to go for an inky or bold shade, provided you ensure artificial lighting is good enough to keep the room well-lit at night. The light cast by the wall colour is important, too. Which paint finish for bathrooms? As for the finish, it goes without saying that the paint needs to be able to stand up to moisture, if not to splashes and the occasional drenching, so always check when you're buying bathroom paints. That doesn't completely discount an emulsion paint, especially if the room is well ventilated, but if you do opt for this finish, be prepared to redecorate more often. Ideally, bathroom paint should be wipeable, mould-resistant and appropriate for the surface you're using it on, whether the walls, woodwork, furniture or even the floor. To help you out we've rounded up the best paints for bathrooms. If your bathroom faces north or has a small window, it's likely to suffer from poor natural daylight, and may feel cold and unwelcoming as a result. You can fix this with a good paint colour choice: deep spicy shades calmed by muted naturals will make a bathroom feel instantly welcoming. Ensure the bolder shades have earthy rather than citrus tones, and match them with flooring in a natural material and furniture in dark, richly grained wood for a look that oozes character. Love this bathroom paint scheme? You will love our orange room design ideas (promise they aren't as garish as they sound). A deep orange like Dulux's Toasted Terracotta would warm up the coldest of rooms. Love the trend for ombre paint effects (where one colour gradually fades into another)? It's the perfect way to give your bathroom a hint of subtle colour - and if you have panelling on your bathroom walls, it's a breeze to achieve, either with a whole selection of tester pots, or by carefully diluting your paint colour with white as you go along). Check out more of our awesome ombre paint ideas. Pink continues its surge in popularity, making its way from traditional bedrooms for girls to living spaces in the last few years, and now to bathrooms. How to get the right shade of pink? For vintage style bathrooms like this one, picking a strong coral tone and matching it with a muddy green-grey creates a look that's both bold and easy to live with. Want to see more pink bathrooms? Keep reading down... (or check out our whole feature on pink room design ideas). Whether your bathroom lacks natural daylight, is tiny and needs a space-enhancing paint colour – or you just love white walls – an all-white scheme is an easy win. You can buy a bathroom paint that's practical, without worry about your colour choice, and be safe in the knowledge that it'll last for years. Then, all you need to do is invest in gorgeous-looking bathroom storage and accessories to brighten your space. If yours is a contemporary bathroom and you're a big fan of bright, bold feature walls, why not embrace the trend for a yellow bathroom paint? Keep it to just one wall or go all out and paint the entire room, bath included if you fancy! Dark, dramatic wall colours are migrating out of living rooms and bedrooms and into bathrooms, too – and with good reason: they look elegant and are the perfect backdrop for showing off shapely sanitaryware and pretty accessories. For plastered walls, pick a matt finish for a contemporary appeal; for a woodwork or panelling, go for a mid-sheen paint finish, which will help bounce light around the room. Invest in good bathroom lighting, too. Check out more of our dark and dramatic decorating ideas if that bathroom is your vibe. Loved the pink in the bathroom above? Here's another way to include it in your bathroom paint colour scheme – but with a more traditional finish. The palest of pinks on the walls could look somewhat wan, but with the shade on the shutters, chosen to be a few tones darker, the room looks layered and interesting. We love, love, love this bathroom, but if you're considering venturing a green paint colour like this on to your walls (and even ceiling), do it with these tips in mind: your reflection will look a little green unless your mirror is very close to a window; if the room is light-starved, a while ceiling and white woodwork, matched with a pale-coloured floor, will make the room feel brighter; despite being a vintage-feel shade, this green looks great matched with more contemporary fittings; choose linens and fuss-free accessories to best complement the colour; and, last but not least, make sure your artificial lighting mimics daylight as much as possible so that the room doesn't look murky at night. If your bathroom has large windows, you can afford to go for a deep shade, with no fear of loss of daylight – just keep all the other surfaces, from sanitaryware to woodwork, white and bright. This vivid royal blue bridges the gap perfectly between contemporary and trad – perfect for a modern take on a period scheme. 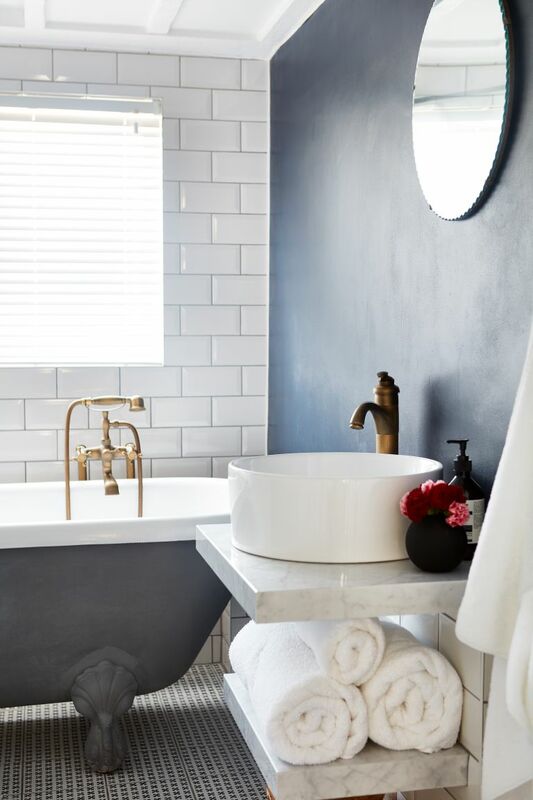 Bathrooms can feel cold and unwelcoming if they're decorated in pure white – but add a hint of creamy brown to the bright white and you have a warm, neutral shade that makes the room glow even on dull days, and definitely under lamplight. And, if you want to switch up the colours in the room, you can do so with an ever-changing array of colourful towels. Blue can be a cool shade that's not best suited to a bathroom – although is often a go-to choice. But you can get it right if you choose a warm shade of blue, in other words, one that has a decent helping of yellow in its makeup. A fine example is teal: lighter teals being better suited for making small bathrooms feel larger and lighter, deeper shades creating a more dramatic finish and a great contrast for white sanitaryware. Paint colours below by Crown Paints. Inspired by the bathrooms you've seen in boutique hotels? You can achieve this look yourself with a deep, dark, inky shade for walls, but keep ceilings and floors white to help bounce light around – and add texture and glamour with artworks, gilded mirrors and, if there's space, an armchair (although you can add similar luxe with a deep pile bath mat and fluffy towels). If you're after a country-style feel for your bathroom, picking a paint colour in a natural shade, and matching it with wood and a soft, creamy white, will give you the desired effect. A whole room of pastel green could be a bit much so pinch this trick and only paint a quarter of the way up the wall so the pastel colour doesn't overwhelm the space. Want to give your bathroom a splash of colour but don't fancy committing to painting any walls? Try painting the door instead. We love how this deep blue (try something like Farrow & Ball's Stiffkey Blue) looks in this clean, all-white bathroom, adding just the right amount of colour to stop the space from look too clinical. Check out how easy to can be to paint an interior door yourself with our step-by-step guide.